Sam Hutchinson and Steven Fletcher will serve two and three-match supensions respectively following their red cards against Brighton and Hove Albion. 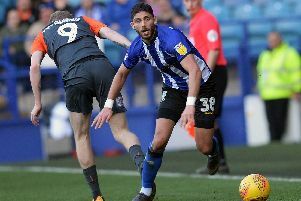 Defensive midfielder Hutchinson, who has been a revelation for the Owls this season, was sent off late on against the Seagulls after a poor challenge on substitute Solly March. It was Hutchinson’s second dismissal during the 2016/17 season, meaning he will sit-out the trips to Bristol City and Wigan Athletic next week. Centre forward Fletcher saw red after clashing with Dale Stephens and will miss the fixtures with Bristol City, Wigan and Birmingham City. Meanwhile, Brighton will find out today from the Football Association whether they have been successful with their appeal over Glenn Murray’s red card in Friday’s promotion tussle. The striker was penalised for handling Glenn Loovens’ goalbound effort.